I fell in love with Pretoria in 1999. I attended a friend’s wedding in Johannesburg but stayed at a friend’s apartment in the Sentoza block of flats in Pretoria, Sunnyside. I was single (moved from a relationship that didn’t work), childless and in my mid 20s. The following year I left the Eastern Cape for Pretoria on a 6 months contract job. Yes, that's how much I loved Pretoria; I was prepared to take such a risk. I stayed in Kotze Street, in Sunnyside with a friend. I worked in Arcadia/Gezina border, Soutspatsberg Road. There is no bus from Sunnyside to Arcadia, so walking was the order of the day. I really didn’t mind. In any case minding wouldn’t have changed the situation of lack of public transportation that connects the two neighbouring suburbs. And at my age then, that distance was not bad. Those were the fun days really. I was a block away from Sunnypark Shopping Centre. I loved shopping for shoes from Grand Shoe (I wonder if it still exists) and food from Woolworths Food and Checkers. Then there was Queenspark which had permanently “On Sale” clothes. 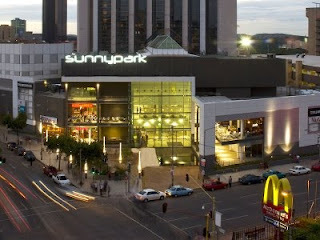 I look at Sunnypark today and see a huge difference after undergoing a revamp to the tune of R300M. A well needed upgrade after more than 30 years of the mall’s existence.